Designer ice cream brands can be pricey and might not always have exactly what you want…not enough nuts, teeny-tiny chocolate chips and so on. Why not save a little money and make your own custom blend at home using your very own ice cream maker? You know you always wanted one! 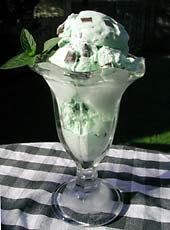 Mint Chocolate Chip Ice Cream has always been a favorite of mine. The beauty of making your own is that you control the size and quantity of chocolate chips. Chunks or shavings, a lot or a little, you make the call! *You will need an ice cream maker for this recipe. Be sure to pre-freeze your freezer bowl if necessary, or buy rock salt if you have the old-fashioned kind. Be sure to pre-freeze your freezer bowl if necessary. Combine cream, milk, sugar, peppermint extract and food coloring in a large bowl until well blended. Freeze mixture using an ice cream maker according to manufacturers directions. Add chocolate chips/chucks 5 minutes before the end of the cycle. This entry was posted on Wednesday, September 12th, 2007 at 2:15 pm	and is filed under Desserts, Master Recipe Index, Vegetarian. You can follow any responses to this entry through the RSS 2.0 feed. You can leave a response, or trackback from your own site.